Sometimes, opportunity knocks at strange hours. 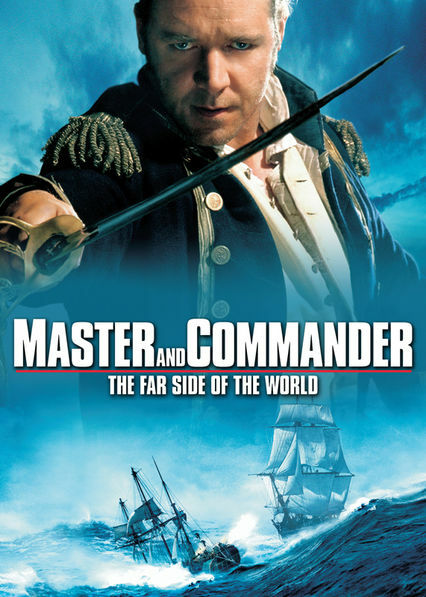 And on the set of a major motion picture (in this case Master and Commander), right in the middle of lunch, the opportunity might just come to die. The scene opens on a large, cozy studio cafeteria down in Rosarito Beach. Enough room for probably 80 actors, extras, regulars, and staff to stock up on calories in between scenes. It was odd, having our heads in 1805 all day long, and coming back to 2003 just long enough to run some celery through the juicer, stuff ourselves, and joke and check messages before going back to work. And movie-making is hard, hard work. That day, there was someone going around the cafeteria tables asking questions. And one by one, several of the made-up sailors brushed them off and got back to their meals. Maybe someone pointed at me. I don't remember it exactly. I was a bit of a nut who came here wanting to try everything, learn everything. That Guy turned out to be the stunt coordinator, and they needed someone willing to die after lunch. Who could say no to that? 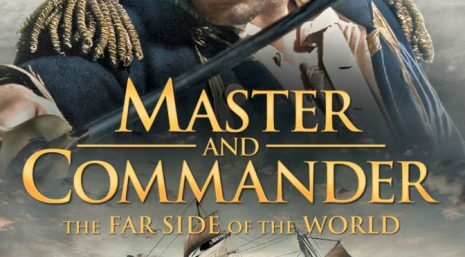 The people who get together to make historical adventure films are a fascinating mismatch of characters from all walks of life. Some of them think that being an extra will launch an acting career, some are working actors, some are historical re-enactors, some just want to get their faces on screen without breaking a fingernail, some are technical experts, some are there for work and a paycheck, some are even there to hide from the law. I thought of it as the world's most expensive role-playing game. I got training in tall ship sailing, swordfighting, theatrical combat, antique guns, cannons, nautical lore, and more than a few bawdy songs on set late at night. So, sure, I can die two centuries ago on some random Thursday in Mexico. The shot was simple, explained to me while someone on the stunt team was strapping some kind of back brace on me. My character would have a gaping neck wound, and two stunt guys would be pulling me across the deck by my legs while I left an 8-foot-long trail of gore. Yeah, I like a good challenge. They gave me a surgical glove full of fake blood to hold up against my neck and … squish, worked like a charm. I think we did two walk-throughs, so the stunt guys could get a feel for how much I weighed, and the full machinery of the production figured out the technical details. The second take was fun. On the third take, I got stuck. You see, I had a long braid of hair, being in the Royal Navy circa 1805 and all. And it was a wooden deck undergoing lots of wear and tear. So I got stuck, and I swear I heard one of the stunt guys holding one of my feet say “Pull harder!” If you ever want to see epic, creative problem-solving skills -- people solving unexpected complications on the fly with thousands of dollars an hour riding on their backs -- watch a movie production in full swing. Some solutions are brilliant, as high-tech or low-tech as needed … and sometimes it's just a matter of pulling harder. Well, it didn't work. I was stuck good. It all seemed very funny at the time, but then I couldn't pick up my head to see what had happened when the shot was over. Turned out there was a 5-inch long splinter in one of the deck planks, and it ran through my braid, and it took some tugging to get me free again. Bit of a wake up call. But, no harm, no foul, let's try it again. We're having an adventure here! The fourth take was another success. And after some analysis by the cinematographer, stunt crew, and easily a dozen others, they said it was in the can. Thumbs up, my little scene in the sun was over. Lots of joking, some huzzahs, and some camera flashes as wardrobe, continuity and other teams documented the location of everything at the end of the shot. Check out the attached image of me at the end of the ordeal. 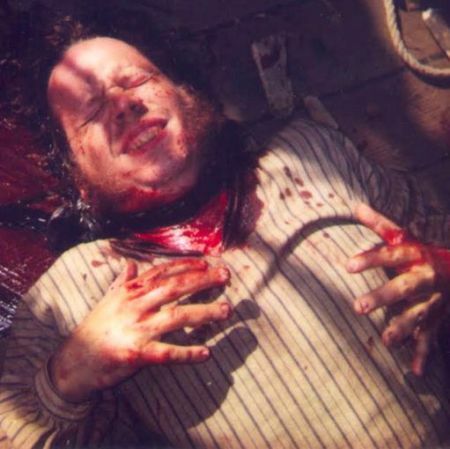 We filmed Master and Commander in a very realistic, rather gory style, but somewhere during post, the whole film was color edited to remove most of the blood and guts and soften it up a bit. The reality of these naval battles was almost too gruesome to comprehend; the explosives, gunshot wounds, cannon balls blasting through walls and spraying dozens of us with deadly splinters, splatters and bits of bodies. Now, smiling at my successful trail of gore, and caught in the shuffle of the crew setting up for a new scene, it was back to the usual routine. Except that I was still soaking in blood. An absolute human tower of corn-syrupy glop. Someone put a towel over me and I headed off the deck. I walked down the gangplank, across the studio lot to our lounge, leaving bloody drips and footprints behind. I shambled through the training area (huzzah) feeling like some Lovecraftian creature with my trail of ichor, and when I got to the shower area, someone handed me a white cotton robe. White? Really? They really needed a series of colored robes: guy arriving from battle gets gory red; after the first shower, slightly gory red; after the second shower, just-a-flesh-wound pink ... and then I was human again. Oh well. I tried not to, but I left a mess that only the Cat in the Hat could clean up. Comically, for the next few days, I was asked to step out of various shots because everyone heard I had died. But we were a core group of 50 guys portraying a crew of 200. At first it took some convincing, even when a shot weeks later was happening long before I died, but I always knew darn well which me was still alive. Somehow, my shot made it the big screen, near the end of the first sneak attack by the French. I was that guy clutching his neck, who gets dragged away and left for dead. I always wondered how much work goes into a single four-second shot of a film, and this was a real eye-opener. Opportunity knocked, and for a moment I was 30 feet long and having the time of my life. The whole production was a mind-boggling logistical adventure. A few hundred amazing people coming from all over the world to create something together. If you have ever made fun of movie credits that mention folks like “craft services” or “transportation”, I assure you, those folks are key elements. Without food we would have become a raging zombie hoard, without transport we never would have found those remote locations; we need all those people, setting up generators, scouting locations, and renting an armada of support boats. Without them, there would have been no film. You can always Google “film production” in your own home town, maybe find your own chance to paint the town in a film. Whether it's a no-budget student project or a massive project, they need people of all shapes and sizes, all looks, and a willingness to take a shot at something a little bit nuts. Scott Virtes has had over 500 stories & poems published since 1986. His works have appeared in Nature, Analog, Space & Time, Ideomancer, Star*Line, Scifaikuest, Illumen, and many more. He has two story collections and 5 poetry chapbooks available. Cannabis industry programmer by day, creative after dark, he can be seen performing classic rock tunes around the San Diego area.